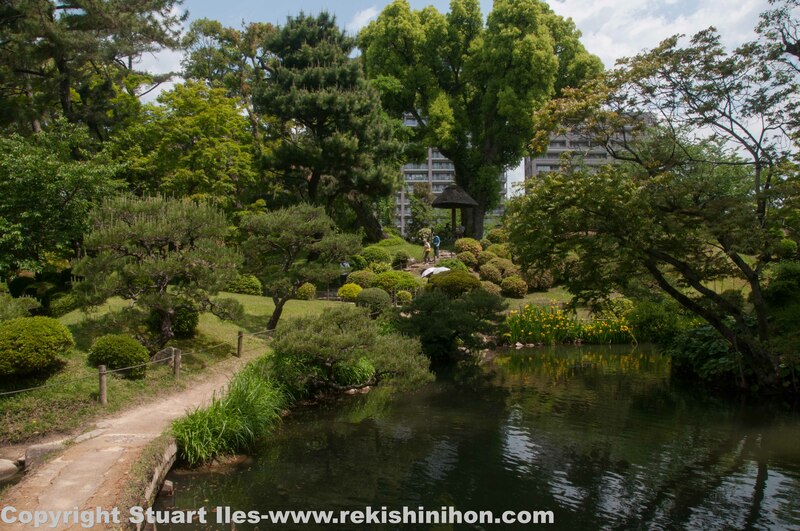 Shukkeien, historical gardens in Hiroshima. 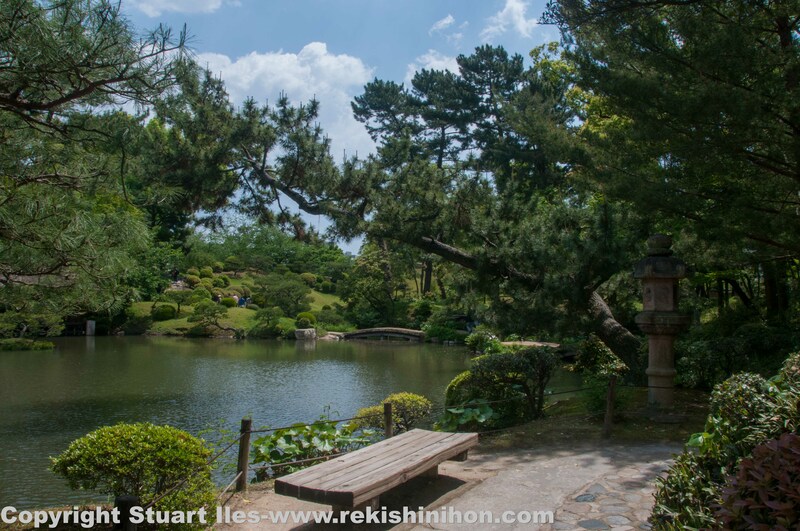 Shukkeien gardens date back to 1620, a year after feudal lord Asano Nagaakira was made lord of Hiroshima. 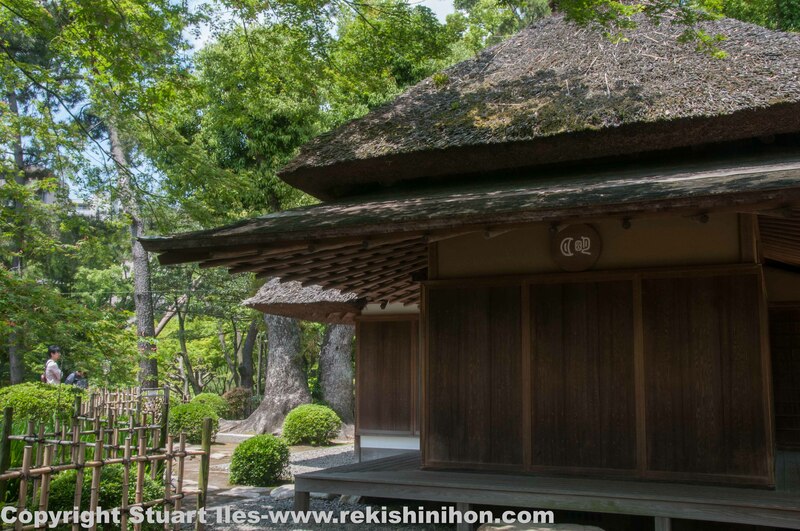 Asano’s principal retainer, Ueda Soko, a master of tea ceremony built and designed the gardens. The gardens were built as an expression of many miniature scenes modeled on Xihu (West Lake) in Hangzhou, China. The centerpiece of the park is Takueichi pond, which looks like a mini Setonaikai, contains 14 smaller islands and is surrounded by tea houses, a small shrine, a viewing mound, a tea plantation, a herb garden, a beautiful fresh water stream and a single walking path that a lord could stroll while enjoying the scenery. Until 1945 the gardens only underwent one major restoration. 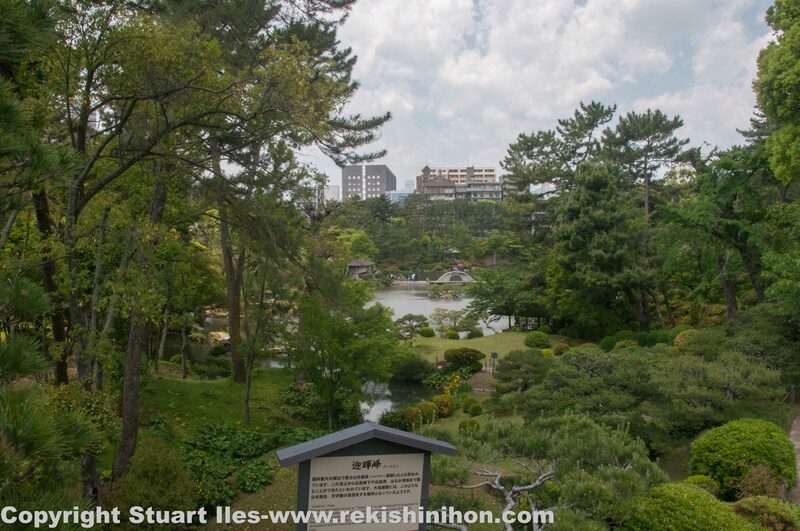 The 7th Lord of Hiroshima, Asano Shigeakira invited famous Kyoto landscape gardener Shimizu Shichiroemon to update the park from an early Muromachi design to a modern Edo period design, the work was conducted from 1783 to 1791. 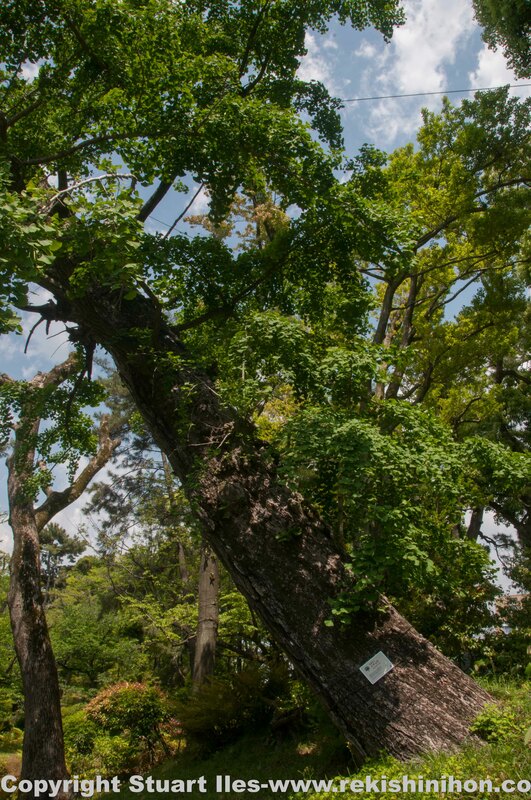 In 1940 the park was donated to the Hiroshima Prefectural government and designated as a National Scenic Spot. Only a few year later it was victim to the A-bomb and totally destroyed. Immediately after the explosion the park became a refuge for many people trying to escape the devastation, unfortunately most of these people didn’t survive and the remains of 64 people were found in 1987, the ashes of their remains were laid to rest in the Memorial Tower in the Peace Park. In 1951 the gardens were re-built to the original plans from the 1783 redesign. In 1964 the Seifukan is restored and in 1974 the Meigetsutei is restored. According to the flyer, the gardens attract abut 180,000 visitors a year and I really enjoyed the hour I spent there. It’s a nice thought that I walked along the same path the Asano feudal lords did 300 years ago. The gardens are about 1.2km from the epicenter of the blast and this is what the gardens looked like just after. Please note the tree that has been knocked over by he blast. A view of the center pond from the south standing next to the Seifukan tea house. 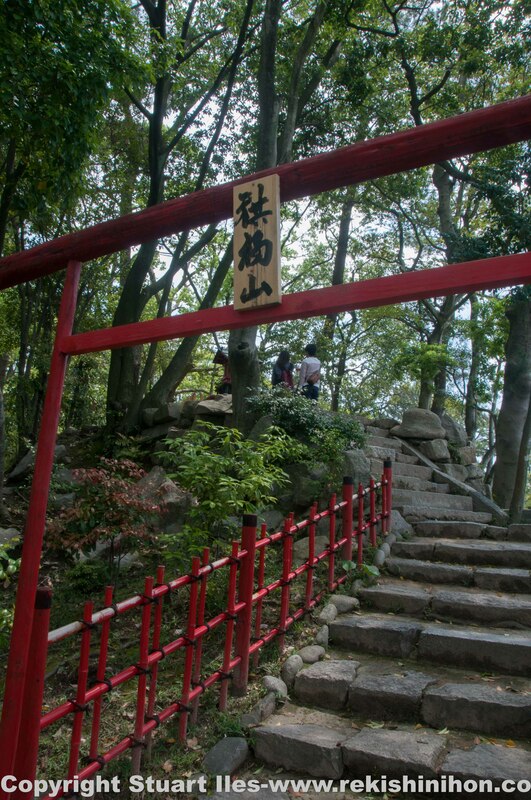 Walking anti-clockwise, a view of the Yuyu-tei, a viewing platform. North of the Yuyu-tei is the Flower viewing seat which sits at a higher level to the rest of the park so you get a nice view of the whole gardens. Remember that tree in the above photo? Well this is it today. 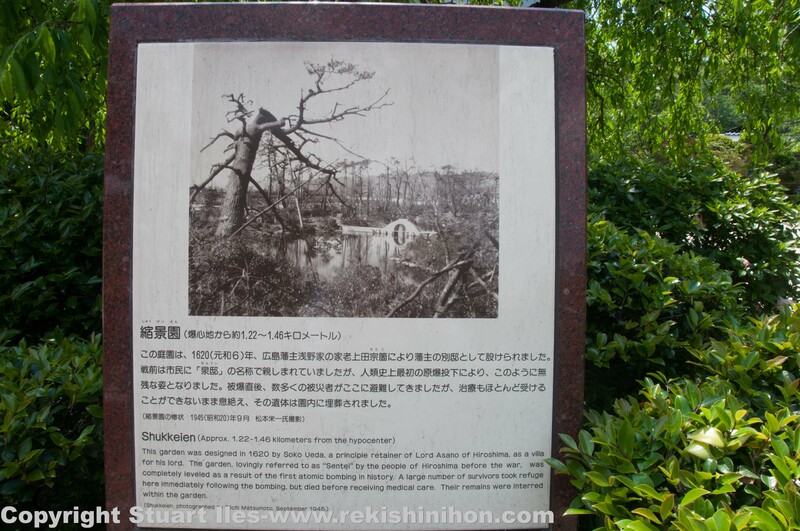 The Ginko tree was blown over to this angle by the blast and was the only tree in the gardens to survive. It is 200 years old and its seeds have been sent around the world as peace offerings. Climbing up to the highest point of the gardens. The Geiki peak is a man made mound to resemble Mt Fuji. From the top you could see Hiroshima Castle and Hiroshima bay and on a clear day Miyajima. Modern buildings however block all of these views today. There were a lot of people visiting the gardens as it was the Golden Week holidays. 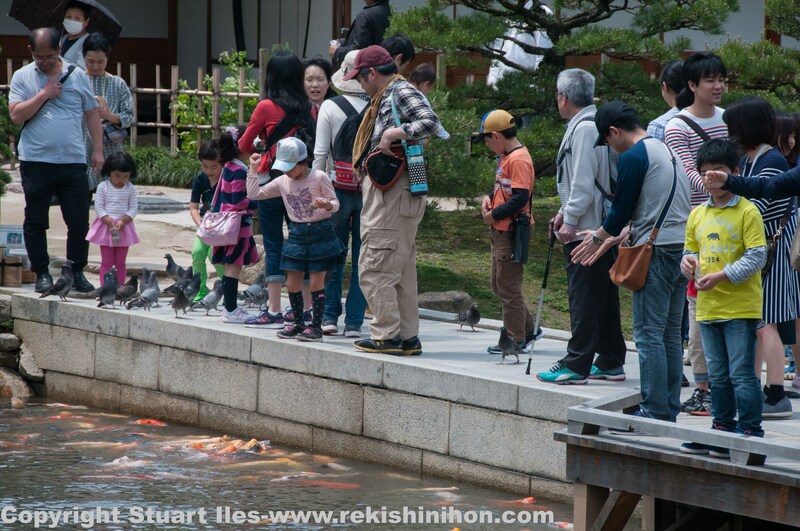 You can feed the many carp in the pond by standing on the Koko-kyo bridge. Path leading up to the small shrine. This high point is named Mt.Kifuku. 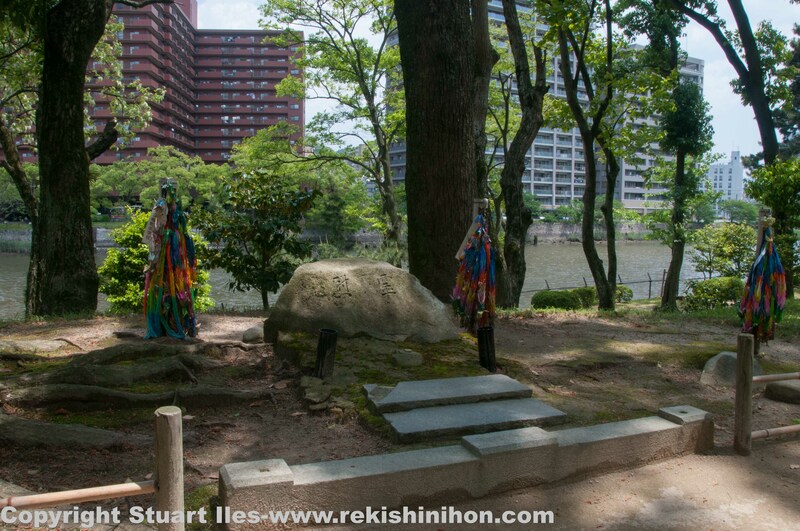 In 1713 Asano Yoshinaga, the fifth lord of Hiroshima built this shrine for peace and quiet and remembrance of the lords before him. This is the memorial stone dedicated to those 64 victims of the bomb who took refuge but unfortunately died while waiting for help. Meigetsutei tea house, Meigetsu meaning beautiful moon – this tea house has a Sukiya design, Japanese pampas grass thatched roof and wooden shingles. It sits on top of a mound which allows for excellent views of the moon. 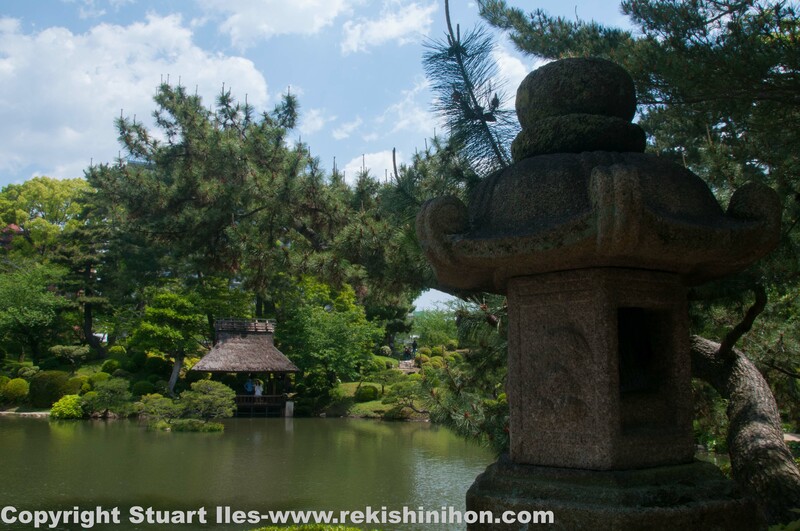 Coming back around to the starting point is the Seifukan the main tea house which overlooks the pond. It is built in the sukiyazukuri tea cottage style. The western room of the tea house is a writing room and the eastern room is fitted with a lyre shaped window which perfectly frames the Koko-kyo bridge which straddles the pond. Words and photos by Stuart. 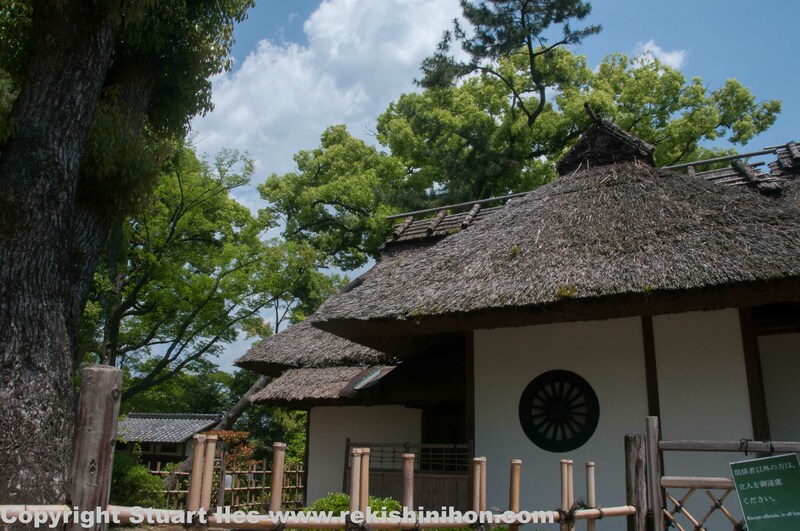 Next Post Chugoku Air Defense Room – Hiroshima castle grounds.